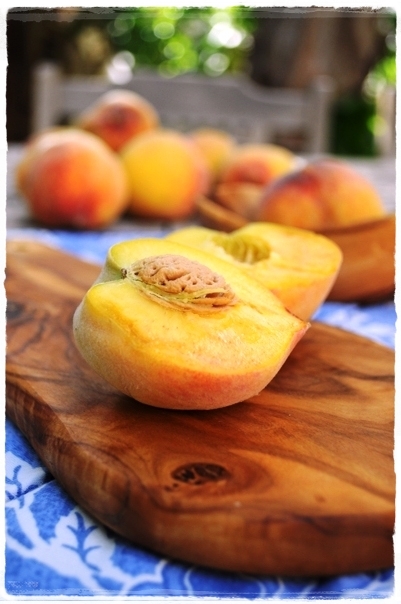 Although the summer temperatures are rising, most of the peaches in the supermarket are still rock solid and without fragrance. Like a lot of produce they are picked underipe and never develop juice or sweetness; some have been sent from Europe and some all the way from the USA. However I spotted a little punnet of six hiding away. There was no country specified so I suspected they’d be ‘local’ which means anywhere from the region. They were a little bit imperfect, the odd bruise here and there but I prised open the plastic lid and sniffed. There was something there that encouraged me to hope and I bought them with a single thing in mind. I had been dreaming about this particular tart since last August when I tore the recipe out of Olive magazine. I drew the line at fresh raspberries as they are of overdraft inducing price – frozen would have to do. It’s hard to get my kitchen cool enough for the best pastry making now that it’s over 40C outside and my baked tart shape came out a little rustic! Given my recent luck with custard I gave a little wish when it went into the oven. 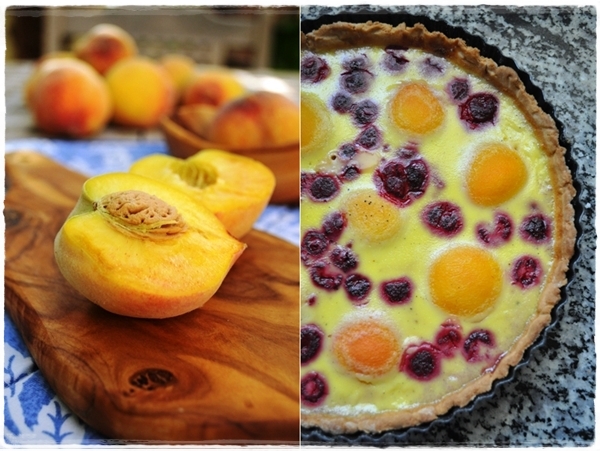 Deep joy when it emerged, the custard set but slightly soft, the raspberries bleeding their tart juice, the peaches looking like fried eggs peeping through their yellow mantle. I made the tart to serve to a group of really dear friends and thought there might be a slice left to take a beauty parlour shot. But no, you’ll just have to take my word for how picture perfect each slice was. And after all, you feast with your eyes first but that’s not the end of the story. Method – The best way to make the pastry is in a food processor. Place all the pastry ingredients in the bowl and process until it forms a firm dough. Then turn it out and knead lightly before placing in a plastic bag and leaving in the fridge for 30 minutes to rest. Preheat the oven to 200C, and place a solid baking sheet inside to preheat as well. 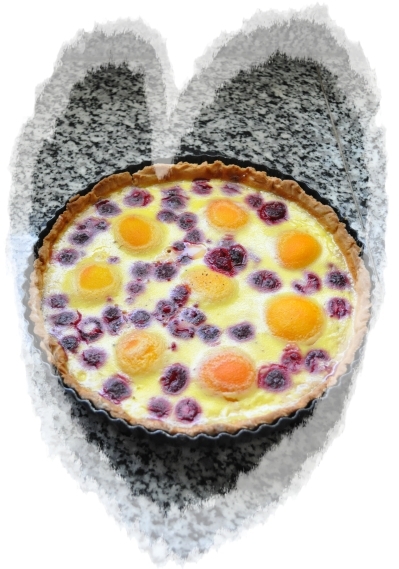 Now roll out the pastry as thinly as possible and carefully line a deep fluted quiche tin with a loose base, 23cm diameter and 4cm deep that you have lightly oiled, pressing the pastry around the base and sides so that it comes about 5mm above the edge of the tin. Then prick the base with a fork and brush it all over with lightly beaten egg white. Bake on the baking sheet on the middle shelf for 20 minutes then, as your remove it, turn the temperature down to 180C (this part can be done in advance). While the pastry is baking prepare the filling. Slice the peaches in and twist in half. Remove the stones. Put the peach halves in a pan, just cover with water and bring to the boil. Blanch for one minute. Remove with a slotted spoon and when cool enough to handle peel off the skin. Leave to drain. Pour the cream into a saucepan and scrape in the vanilla seeds and the empty pod. Place the pan over a medium heat and bring to a simmer for 10 seconds. Beat the whole egg and yolk with the sugar until creamy. Whisk the hot cream vigorously into the eggs until thoroughly mixed. Remove the vanilla pod. Arrange the peach halves, cut-side down, in the pastry case. Dot with the raspberries and pour over the custard. Return to the oven (heat lowered to 150C) and bake for 45 minutes or until the custard is just set (slightly wobbly in the middle). Cool in the tin and then remove. Feeling peachy? Appreciate your comments. me too, i m in for a slice any time…looks amazing…i never dare use frozen fruits for tarts, but i’ll have to agfree with you, some fresh berries in dubai are just too much! i ll have to follow you example and try. Lovely post with amazing pictures! Fatma, Rado, In a Frying Pan – really glad you stopped by and appreciate your comments. I’ve missed you too Silvia. That sounds absolutely delicious! We are on holiday in France at the moment and looking for inspiration for all the gorgeous local fruits we are buying in the local markets- this looks perfect! 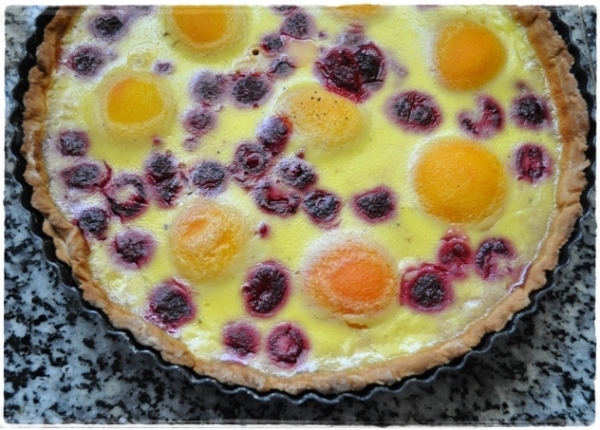 Beautiful summery tart! 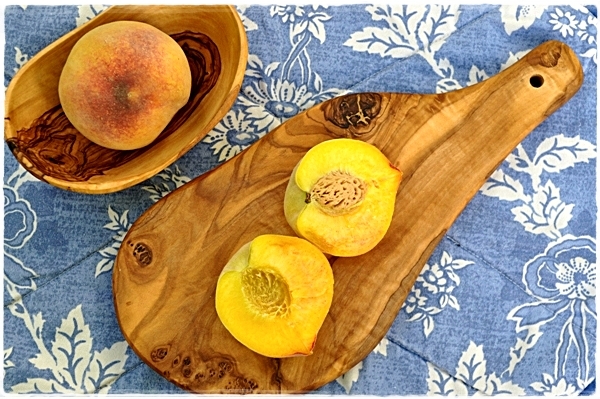 We buy so much fruit these days with our eyes – we really should use more of our senses. And you’re right, a peach that doesn’t smell like a peach isn’t really going to taste like a peach! Raspberries are prohibitively expensive fresh here, so we always use frozen, and find them fine for everything other than eating as is. It’s sad that sweets are so cheap and real treats like fresh raspberries are so expensive. Really? That’s a food crime I hadn’t heard of. Thanks Ren – still on a steep learning curve with my photography! Thanks Ren – I’m taking the course too! Lovely! The second shot of the peaches outside (greenery in the background) is my FAVORITE. It says: summer! this is just to die for!! wow! thank you for sharing this. it is just stunning!!! This is just the kind of dessert I love! I was just thinking that I need to make one of these and yours is inspiring! Delicious and summery. Can’t wait for the European summer rather than the Middle Eastern one thought. Thanks for the comment Jamie. This looks absolutely divine! I don’t make enough puddings, but I can see this one going down really well with friends. Bookmarked!!! Lovely flavors and colors. Fabulous ideas.